The Classical Marimba League Composition Contest Winners Concert was held at the University of Minnesota at Lloyd Ultan Recital Hall on April 1st at 7:30pm. The concert was performed by undergraduate and graduate students of Fernando Meza’s percussion studio at the U of M and showcased a few pieces from the standard marimba literature as well as three new composition contest winners. The full program including performance notes is available. The first piece was Steven Mackey’s “See Ya Thursday” performed by Adam Rappel. Most marimbist are familiar with this piece on Nancy Zeltsman’s CD of the same name. For me, this was the first time I have seen this played and what an acrobatic treat it was. This is an advanced piece not because the notes are flying fast and furious but because of the long stretches and arm reaches to cover the entire 5 octaves of the marimba. I enjoyed Adam’s touch and his ability to convey that sometimes music is not about the notes, but the space between the notes. The second piece was Ross Edwards “Marimba Dances” performed by Brittany Piatz. Evelynne Glennie has performed this on her “Light In Darkness” CD. A piece in 3 movements, movement 3 was performed this evening. Brittany has a nice appreciation for dynamic range throughout and a couple note mistakes didn’t detract from the overall performance which was well received. I did wish this piece would have “danced” a little more and because the room was very dry the mallets were one grade too hard. The third piece was Robert Schumann’s “Remembrance” performed by Eric Neseth. Leigh Howard Stevens arranged and performed this on his CD “Marimba When”. These familiar melodies for piano fit very nicely on the marimba. Tonight’s performance by Eric was note accurate, conveyed the correct style, and was appropriately “pretty”. The fourth piece was Leander Kaiser’s “Minotaurus 4.3” performed by Scotty Horey. This piece was the winner in the classical category of the CML competition. The excitement of seeing a new piece performed was only matched by Scotty’s powerful and confident command of the marimba. 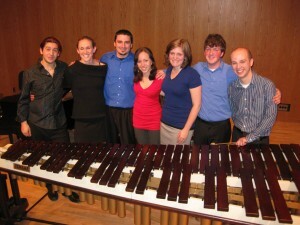 The piece’s difficultly appeared to be at the advanced college level and didn’t appear to require advanced marimba techniques. There were a number of arpeggio sections sprinkled through the 8 minutes and the piece ended with a powerful and satisfying ending. The fifth piece was Jens Schliecker and Nils Rohwer’s “ConcorDance” performed by Adam Rappel, marimba and Leah Siltberg, piano. Although the program didn’t mention this was in two movements there was a definite break between the 4 mallet first movement and the 2 mallet second movement. The piece does require a 5-octave marimba. The piece started with some tonal chords that were balanced very well with the piano throughout movement 1. For the second part, the rhythm picked up and the the piece had some “pop”. The sixth and final piece was Kit Mills “Three European Folksongs” performed by Jennifer Klukken, Brittany Piatz, and Ethan Shervey performing at the same time on one 5-octave marimba. This piece was the winner of the romantic category of the CML. Movement 1 was entitled “French” and featured a 2-mallet player on the top octave with the other two performers using 4-mallets in the lower registers. Movement 2 entitled “English” which features good passion and energy by the performers and some sections requiring rolls. Movement 3 entitled “Spanish” started with a 4-mallet solo which handed off to a 2-mallet cadenza and then a 12/8 triplet feeling melody. A quick suprise with the mallet shafts kept the piece lively and light and definitely earned the title “Spanish”. All 3 performers negotiated the mallet changes and close playing quarters very nicely and this piece was received very well by myself and the audience. Overall this was a wonderful concert which was enjoyed by over 50 audience members. I want to personally thank all of the players for a very enjoyable evening. I have included a photo below of the performers. The next blog post will focus on the marimba competition part of the event. This entry was posted in Classical Marimba League, Marimba Performances by jeffsass. Bookmark the permalink.